by Tommy Goudge (August 30, 2013) – 109 drivers signed in to race on Nathan Ackland State Farm Insurance “Labour Day Special Night” at Ohsweken Speedway on Friday. Only the Affordable Towing & Recovery Thunder Stock heat races, and the postponed HRW Automotive Mini Stock feature presented by Evers Financial from July 19 were completed before rain washed away the remainder of the program. The Thunder Stock B-Main and A-Feature events, and the TUSA Canada West Mod Lite series event will not be rescheduled. As per the Ohsweken Speedway Rain Check Policy, all tickets and wristbands will be honoured next Friday, September 6. Please bring your Friday, August 30 ticket stub for main grandstand entry on Friday, September 6. Pit Pass Tickets AND Wristbands from Friday, August 30 must be presented to gain entry to the pit area on Friday, September 6. Those wishing to use their Rain Checks will not be allowed without all required admission tickets, stubs, and wristbands from Friday, August 30. As per track policy, the 50/50 number from Friday, August 30 will be drawn on Saturday, August 31 at Styres Gas Bar, and the winning number, amount, and other details will be posted at www.OhswekenSpeedway.com. Please visit the website for more information. 21 Sprint Cars were signed in to race, but none of their portion of the event was run before the rain came. The Sprint Cars will compete in their 25 lap Season Championship feature next Friday, September 6. Four Thunder Stock heat races were completed for the 31 car field before rain cancelled the rest of their event. Terry Martin, Chris Dickie, Cory Turner, & Ryan Turner were the heat race winners. Their B-Main and A-Feature will not be rescheduled. The Thunder Stocks will compete in their 25 lap Season Championship feature next Friday, September 6. Brittani Myers and Mike Giberson started the postponed Mini Stock feature presented by Evers Financial from July 19 on the front row, but Cole Rodwell took over at the front before the first lap was completed. Rodwell held the lead until hard-charging Chase Hess moved up from his 14th starting spot to take the lead on lap 7. Hess took off after that, and led the final 9 laps to take his first win of the season. Rodwell took the runner-up spot, followed by Jonathan Ayrton, Steve Miller, and Jeremy May. 27 Mini Stocks were signed in to race in the regularly-scheduled portion of the event, but were not able to run any of it before the rain came. The Mini Stocks will compete in their 20 lap Season Championship feature next Friday, September 6. 15 Bombers were signed in to race, but none of their portion of the event was run before the rain came. The Bombers will compete in their 15 lap Season Championship feature next Friday, September 6. 15 Mod Lites were signed in to race in their second attempt racing at Ohsweken in 2013, but none of their portion of the event was run before the rain came. Their event will not be rescheduled this season. Woodstock Ford presents “Season Championship Night” at Ohsweken next Friday, September 6, featuring Corr/Pak Merchandising Sprints, Affordable Towing & Recovery Thunder Stocks, HRW Automotive Mini Stocks, and Gale’s Auto Aftermarket Bombers. Spectator gates open at 6:00pm, with racing starting at 7:30pm! The 9th annual Canadian Sprint Car Nationals weekend is coming up on Friday, September 13, and Saturday, September 14 at Ohsweken Speedway. The pre-entry list for this huge event already includes 35 drivers from as far away as Oklahoma, and Iowa, with many more are expected. 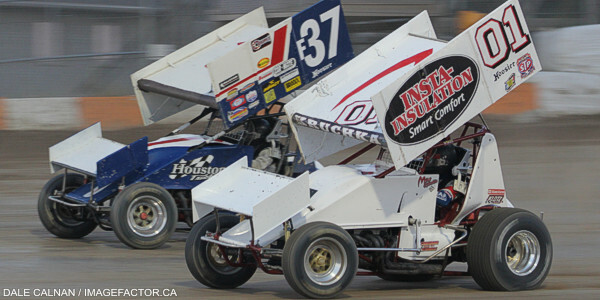 Stay tuned to www.OhswekenSpeedway.com for all your Canadian Sprint Car Nationals news. Advance reserved seat tickets are now on sale for the 9th annual Canadian Sprint Car Nationals on Friday, September 13, and Saturday, September 14. Please visit www.OhswekenSpeedway.com and check out our new system for online ticket sales. Thursday Night Micro Sprint Racing takes place on the Warm Up Track in the Ohsweken Speedway Pits each week from May 16th to September 5th, and spectator admission is just $5! Visit www.OhswekenSpeedway.com for more information. 1. 38 Terry Martin (Ohsweken), 2. 77 Brett Rodwell (Caledonia), 3. 119 Shaun Quinn (Caledonia), 4. 10 Jake Brown (Brantford), 5. 17 Rob Disher (Grimsby), 6. 4 Dale Gyokery (Jarvis), 7. 93 Melissa Miller (Ohsweken), DQ. 00 Robbie General (Ohsweken). 1. 1 Chris Dickie (Brantford), 2. 23 Trevor DeBoer (Caledonia), 3. 44 Kevin Dawson (Caledonia), 4. 25 Billy Bleich, Jr. (Port Robinson), 5. 55 Mike Thorne (Caledonia), 6. 31 Dave Bailey (Hagersville), 7. 12 Brad Herron (Waterford), 8. 84rk Ryan Beagle (Vittoria). 1. 19 Cory Turner (Caistor Centre), 2. 68 Aaron Turkey (Ohsweken), 3. 28 Jim Lampman (Caistor Centre), 4. 33 Jack Myers (Wainfleet), 5. 04 Wyatt Van Wart (Cambridge), 6. 777x Steve Hess (Ohsweken), 7. 48 Mike Graham (Caledonia), 8. 911 Nick Liverance (Brantford). 1. 91 Ryan Turner (Caistor Centre), 2. 81 Karl Sault (Dundas), 3. 11r Bryce Richardson (Port Colborne), 4. 2 Lee Winger (Caledonia), 5. 37 Jeremy Bean (Stoney Creek), 6. 9 Dave Silverthorn, Jr. (London), 7. 00x Derek Miller (Ohsweken). ADULTS $12, SENIORS AND STUDENTS $10, KIDS 12 AND UNDER FREE! SPECTATOR GATES OPEN @ 6:00 P.M., RACING @ 7:30 P.M.
About Ohsweken Speedway: Founded in 1996, Ohsweken Speedway is a motorsports complex which includes a 3/8 (0.375) mile clay oval track. The facility is owned by the Styres family, and located in the village of Ohsweken, Ontario, Canada. 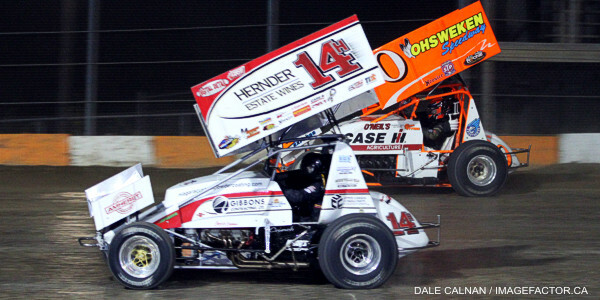 Ohsweken’s weekly Friday night racing program runs from May to September each year, featuring Sprint Cars, Thunder Stocks, Mini Stocks, and Bombers, while the season finishes each year with the annual Canadian Sprint Car Nationals. Ohsweken Speedway also hosts weekly Micro Sprint racing on Thursday nights, and has been a yearly stop on the World of Outlaws Sprint Car series schedule since 2007. Ohsweken Speedway thanks the following sponsors for their support of the 2013 season: Arrow Express, Corr/Pak Merchandising Inc., Renway Fuels & Lubricants Heating & Cooling, O’Neil’s Farm Equipment, McDonald’s Restaurants of Paris & Brantford, Nathan Ackland State Farm Insurance, Klotz Canada Synthentic Lubricants, Burger Barn, Affordable Towing & Recovery, HRW Automotive, and Gale’s Auto Aftermarket.